Continuous thoughts (brain chatter) is a problem many people experience during meditation. Many feel they are incapable of quieting their mind and keeping out thoughts. We often receive emails asking for help from people who write that their mind just will not cease it’s chatter or stay focused on meditation. Thoughts are a natural activity of the mind. They are part of meditation. Stop resisting thoughts and stop trying to make them go away. Become aware of the inner silence that is present in your mind rather than the thoughts. Both occur naturally and both are present while meditating. By stop trying to eliminate thoughts and learning to focus on inner silence you will begin to experience inner peace. Learning to focus is easy. It does not take many years of meditative practice. It takes only a few minutes. How? With mind tools. 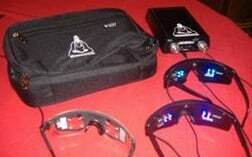 The most advantageous mind tool to use while meditating is the pRoshi NeuroDynamic Activator. The pRoshi generates a visual algorhythmic message that quiets the mind, enhancing the mind’s ability to heal, and mentally, emotionally and physically promotes an incredible sense of deep, timeless, meditative calm.